Nectarascordum bulgaricum – what a mouthful! 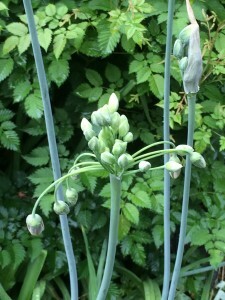 –formerly known as Allium bulgaricum, is a hardy bulb that blooms during the last week of May and into June. It s common name is Honey Sicilian Lily. Now that’s an enticing name. 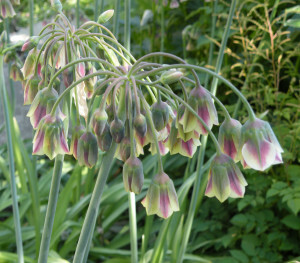 The flower of this bulb is unlike any other although the strappy foliage is similar to that of many of the large flowered alliums. 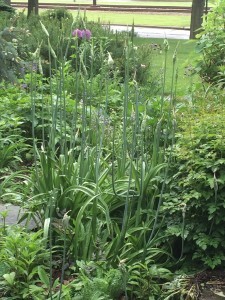 It seems to suddenly emerge on tall, three to four foot stalks, sheathed in a vertical, papery envelope that bursts when pushed outward by the clustered buds that then proceed to separate and dangle. That process takes approximately two weeks. Once the buds separate and dangle on arching stems, they start to open and become green bells with cream and magenta markings. They will stay in bloom for at least another two weeks. This is a bulb, hardy to zone 5, that animals don’t like and you can interplant it with later blooming perennials so that the same space has more than one period of bloom. Ornithogalum is a genus of bulbs with a terrible reputation. 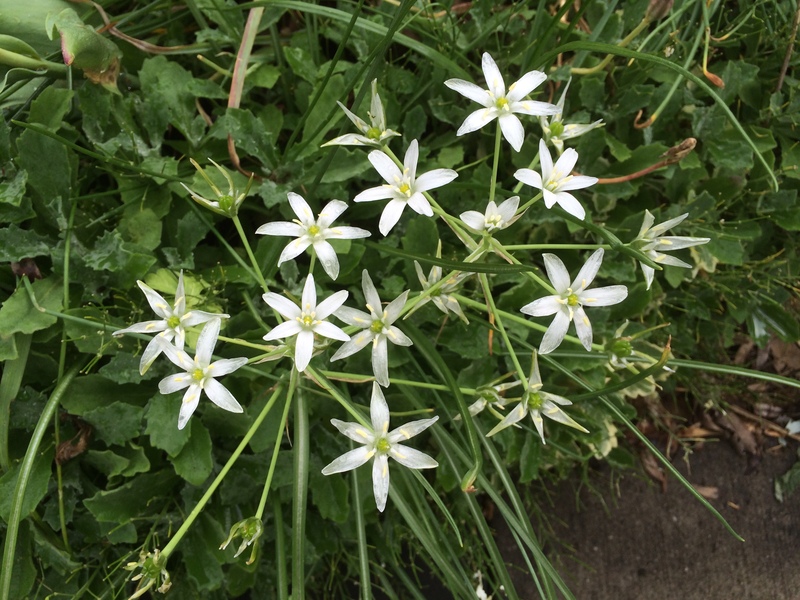 O.umbellatum, commonly know as Star of Bethlehem, can be a thug in the wrong place because each flower, usually blooming in late May, is succeeded by a seed capsule that contains several seeds. Thus this species often forms dense colonies that then go dormant in June. 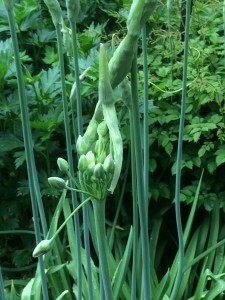 However, I have planted it at the bottom of a hill so that most of the seeds spill onto the sidewalk and are blown away. 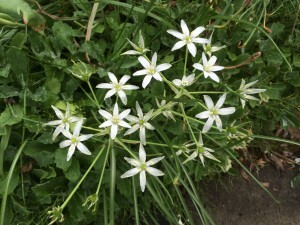 The small, white, star-like flowers have six petals and are only six to nine inches high. A similar species, O.nutans, is commonly referred to as Nodding Star of Bethlehem but is about twenty inches high. 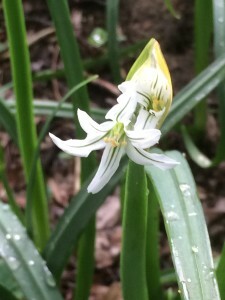 What I especially like about it is the green striping down the middle of the white petals. Like its shorter cousin, it does seed prolifically but it also thrives in partial shade and in moist sites. Keep in mind that these conditions will contribute to its spread. 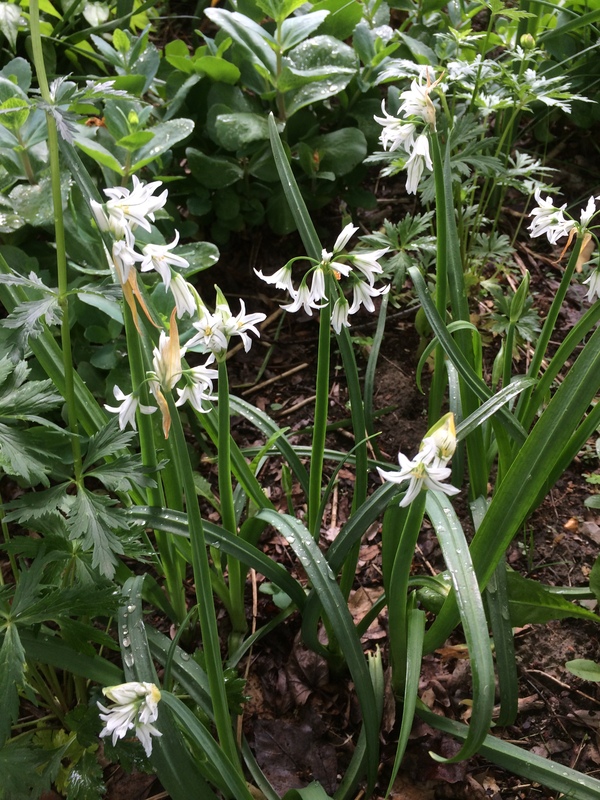 Grow all of these bulbs in full sun and well-drained soil. So, if you want to extend the season of spring bulb bloom into early June, try some of these bulbs.